Overview: Hamilton came to Texas as a five-star recruit out of Compton’s Dominguez High, a school that has produced such basketball luminaries as Dennis Johnson, Cedric Ceballos, Tayshaun Prince, Tyson Chandler and Brandon Jennings, to name just a few. Even back at Dominguez, Hamilton was regarded as a fearsome offensive player, capable of scoring from all over the court, albeit with a tendency to force up wild shots. 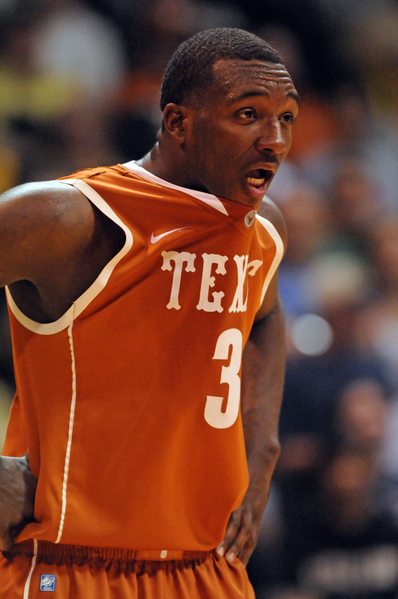 In his first season in Austin, he lived up to his reputation as a uninhibited gunner – as well as his reputation as an uninterested defender – as the Longhorns limped home to an early NCAA exit. However, as a sophomore, Hamilton took great strides to shore up some of those problems, improving his shot selection drastically (while still taking 33% of his team’s shots while on the floor), and as a result, increasing his field goal percentage by three percentage points and his three-point percentage by two, up to 44% and 38.5% respectively. Along the way, he also yanked down 7.7 rebounds per game and handed out 2.1 assists per game. However, his defense still rates no higher than awful and, while a great shooter with almost unlimited range, he isn’t much of an offensive threat off of the dribble and is prone to turning the ball over too much. Nevertheless, while Hamilton still has a ways to go to make the most of his talent, he is a terrific athlete with the size and strength to become a prodigious scorer at the next level. And given the improvement he showed from his freshman year to his sophomore campaign, he seems to be the type of guy who will put in the necessary work to make the most of his skills. Will Translate to the NBA: While shot selection has been a question mark at times, the actual shot is Hamilton’s main strength. He’s got great form, a quick release, range out to well beyond the NBA three-point line and the ever-loving desire to show off that form at a moment’s notice. If Hamilton’s got his feet set, his shot has a very good chance of going in. But better yet, he’s a great shotmaker when he’s not perfectly set and does a great job of making shots that look at first glance to be out of control, a trait that will come in handy when the 24-second clock is waning in the NBA. Needs Work: Hamilton’s offensive decision-making is a work in progress, but luckily for him he’s actually shown considerable progress in that area. However, on the other end of the court, he’s just not very good yet. Aside from showing little defensive intensity, his fundamentals on defense aren’t strong, he too often gambles on steals (and yet still grabs less than a steal per game), does a poor job using his size to influence his opponents and just generally has a long road ahead in developing into an NBA-level defender. It all starts with more effort on defense, and he may need to show that early in order to win minutes. Comparison Players: Charlotte’s Stephen Jackson is a good comparison for Hamilton, a big scoring wing who shoots about a third of all of his field goals from behind the three-point line, doesn’t get to the line a ton, shoots a relatively low percentage, and makes a minimal positive impact on the defensive end. That’s the kind of player that puts up big scoring numbers of the course of a career, but doesn’t spend a whole lot of time playing basketball in May and June. And really, that’s the type of player Hamilton is now. Best Case Scenario: Offensively, Hamilton has the ability to step right into the NBA and score double-figures immediately, especially if he gets picked towards the top half of the draft and winds up on a team that lacks a lot of scoring options. But for Hamilton to truly become a game-changer at the next level, he needs to wind up with a head coach that preaches defense and gets his point across. If Hamilton can become a competent defender and if he continues to improve his shot selection, there could be all-star games in his future. 2014 Projection: A lot depends on where Hamilton winds up. If he goes in the top half of the first round and lands on a rebuilding team, he could be a team’s go-to scorer by 2014. If he drops a bit and lands with a contender, his defensive inadequacies could limit his minutes and stunt his development. We’ll put him smack dab in the middle of the first round to Indiana and project him as a 15-plus point per game scorer by his third season in the league. Best NBA Fit: While Hamilton could go somewhere like New York and immediately fill the role of the designated shooter there, he’d benefit more from being paired with a defensive-minded head coach like Doug Collins in Philadelphia. And with Andre Igoudala rumored to be on the trading block, Hamilton could have a spot ready and waiting for him, provided he is ready and willing to put in the necessary hard work on the defensive end. If a guy like Collins can mold Hamilton into a hard-working defender, a long and productive NBA career should be the reward. This entry was posted on Saturday, June 11th, 2011 at 12:00 pm by rtmsf	and is filed under 2011 profiles, nba draft. Tagged: jordan hamilton, texas. You can follow any responses to this entry through the RSS 2.0 feed. You can leave a response, or trackback from your own site.